The UN has just unveiled a floating city. Or, at least a framework for how floating cities will be built. Throughout the 2010s, a certain set of statistics found their way into every article about urbanism. You know them. They said that a certain percent of people would live in cities by a certain year; “68% of the world’s population projected to live in urban areas by 2050,” according to a recent UN statistic. By 2030, approximately 60 percent of the world’s population will live in cities that are exposed to grave economic, social, and environmental pressures. Further, approximately 90 percent of the largest global cities are vulnerable to rising sea levels. Out of the world’s 22 megacities with a population of more than 10 million, 15 are located along the ocean’s coasts. Serious stuff, all discussed at today’s high-level round table in New York hosted by UN-Habitat, the UN’s coalition on affordable and sustainable housing, along with the MIT Center for Ocean Engineering, the Explorers Club, and OCEANIX, a non-profit group investing in floating cities on this new marine frontier. Bjarke Ingels of BIG—architects of the “Dryline” around lower Manhattan—unveiled his design for a prototypical floating city today, which would be made out of mass timber and bamboo. This proposal would be “flood proof, earthquake-proof, and tsunami-proof,” according to Marc Collins, founder of OCEANIX. The renderings show a series of modular hexagonal islands with a productive landscape, where bamboo grown on the “islands” could be used to make glulam beams. BIG envisions the cities as zero-waste, energy-positive and self-sustaining. The necessary food to feed the population would be grown on the islands. BIG has put toether a kit of parts for each part of the man-made ecosystem: a food kit of parts, a waste kit of parts. 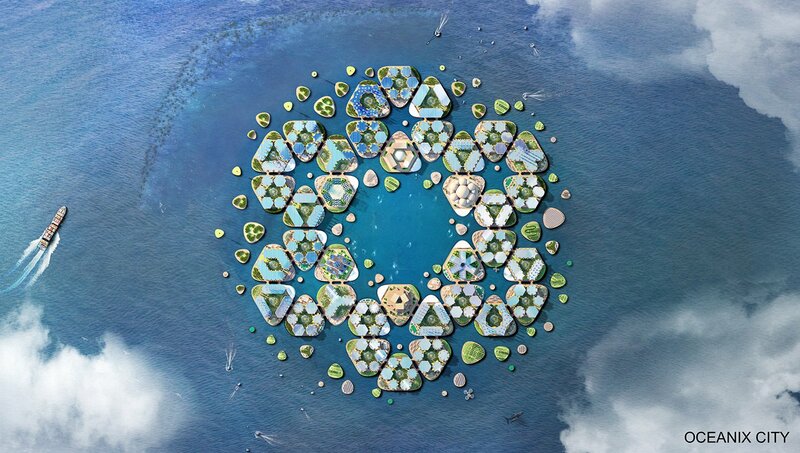 Each island would be prefabricated onshore and towed to its location in the archipelago.